Note: Tom Baker's autobiography, including several chapters devoted to his time on Doctor Who. Also available as an audio reading. Tom Baker was born an Irish Catholic in Liverpool in 1934. Growing up, surrounded by innumerable relatives in a poor but spirited community, he quickly developed a penchant for lying, a passion for football and a suspicion of priests. After time at school spent failing to find a vocation, and eager to achieve approbation anyway [sic] he could, Baker became a monk and spent much time smelling of carbolic soap and avoiding making eye contact with others. Before long he came to the horrifying realization that what he wanted more than anything else was to break all the commandments one by one — a life of charity was clearly not for him. What could he do but become an actor? With ambitions to take on the great roles, he soon discovered that acting mainly involved being out of work, becoming practised at auditioning for inappropiate parts, and drinking. But from a struggling start he went on to appearances at the National Theatre, to work with Pasolini and, finally, to star as the ultimate Doctor Who. 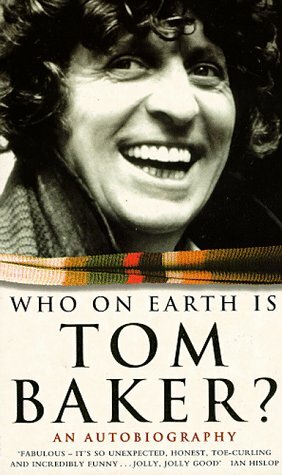 Far exceeding the usual expectations of an actorly autobiography, Who on Earth is Tom Baker? is a richly coloured, startingly wild black comedy. Tom Baker is the kind of man who could drink the old off-the wagon Anthony Hopkins under the table and now spends much of his leisure time mowing the grass around his own gravestone in the local churchyard. His memoirs, full of anarchic humour, surreal, ribald and revealing anecdotes, will stand comparison with those of Spike Milligan, Peter Ustinov and David Niven. After God service, National Service and a spell in the Merchant Navy, Tom Baker became an actor. Widely experienced in film, theatre and on television, he is most well known, in seventy-four countries, for his portrayal of Doctor Who. Note: The surname of Italian film director Pasolini is misspelt as "Pasolino" on the back cover. Growing up in a poor, spirited Irish community in Liverpool in the 1930s, Tom Baker had modest ambitions: to be an orphan, to have a wooden leg, to be a sinner. Instead he became a monk, coveting smells and staring at other men's clogs. Baker left the monastery for National Service and then became an actor. He learned to drink Anthony Hopkins under the table and to take the oddest jobs, while also managing to land parts alongside Olivier in the National Theatre and work with Pasolino [sic]. He finally gave up a stint as a builder's labourer to become the ultimate Doctor Who. 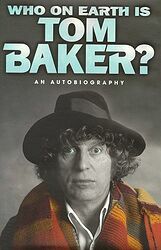 Who on Earth is Tom Baker? is a richly coloured, startingly wild autobiography that reads like a black comedy. Full of anarchic humour, surreal, ribald and revealing anecdotes, it can be favourably compared with the stories of Spike Milligan, Peter Ustinov and David Niven.